I consider laziness a prime motivating factor to many of my decisions (if one can in fact consider laziness in that way, without seeming too oxymoronic). Anyway, as I've mentioned before, life with two small people is just that much busier than life with one, so by the time I get home from work, dinner is had, and kids are in bed, I'm feeling like I just want to veg. Except there's still stuff that has to happen - dishes, making lunches, laundry, general house stuff (our new place needs a lot of work, which falls primarily to hubs, which means that the dishes/laundry that we used to do together now mostly fall to me, while he does such fun things as sand, prime, paint, etc.). I was procrastinating last night, and a FB friend of mine posted a link to these homemade granola bars, which looked super easy and met a couple of important criteria - 1) I had all the ingredients and 2) they were nut-free. Neither of my mini-foodies has allergies, but one of Lil Z's good friends in her class is allergic, and the whole classroom is nut-free. 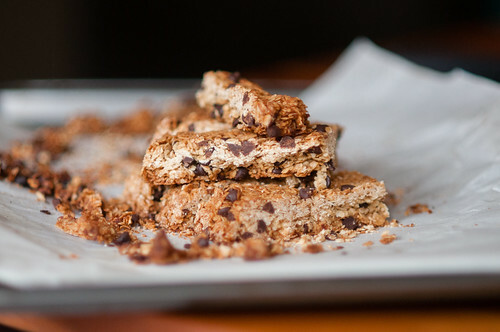 And in the world of homemade snack bars, nut free poses a bit of a challenge - it's easy enough to avoid the types of bars with chunks of nuts, but so many recipes use nut butters as a binding agent. This recipe avoided the nut issue entirely (though you could totally add chopped nuts or anything else to them - raisins, craisins, dried cherries, coconut, seeds, flax, etc.). I made it very simply the first time around, but I can tell you I'll make it again. I halved the recipe, because I only had 2c of oats left, and I also used quick oats, rather than old-fashioned. It turned out fine and had a good amount of crunch (not the yucky mushiness of a lot of homemade bars). I pressed mine in a parchment-lined 9x9 pan, and then slid it onto a cookie sheet to bake, for 30 minutes. Once cool, they sliced quite well and held together surprisingly well (not nearly as crumbly as most homemade granola bars....though still on the messier side to eat). Kinda like a Nature Valley bar. I sliced off the toastiest edges, and the bonus here is that you can keep those delicious crumbly bits, put them in a bag/container for a few days, and use them like granola, so there's no waste. And did I mention you can get them in the oven in about 5-6 minutes? That's my kind of home-made snack. 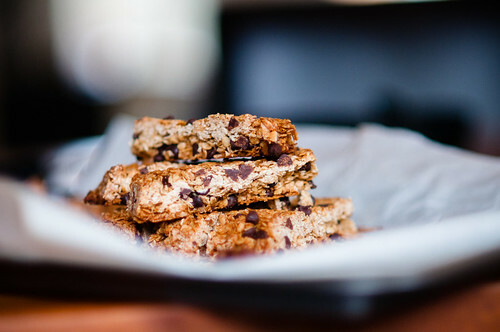 Nutrition wise, they are relatively comparable to a classic purchased granola bar, but in this case, you can use higher quality ingredients, and cut them whatever size/shape suits your audience. Bam! 2. Combine oats, flour, sugar, chocolate chips and salt in one bowl. 4. Pour wet ingredients over dry and stir to combine. 5. Line a 9x9 pan with parchment paper (or foil), and squish the granola into as dense a square as you can. 6. Carefully slide the paper onto a baking sheet and cook for about 30 minutes (if you go longer, it will burn). 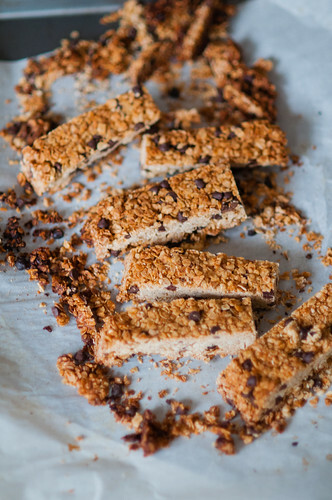 Let cool, then cut into bars, keeping the crumbly bits to use as granola. And enjoy, because they are pretty tasty.